Mini Goombas, originally known as Micro-Goombas and also formatted as Micro Goombas, and also occasionally referred to as Goombettes or Small Goombas, are miniature Goombas that are featured throughout different installments of the Mario franchise. They look like regular Goombas, being brown vaguely humanoid mushrooms, albeit they are notably smaller in size. Their main purpose is usually to slow down the players or otherwise impede their progress. They first appeared in Super Mario Bros. 3. In Super Mario Bros. 3, Micro-Goombas would be dropped by brown Para-Goombas onto Mario and Luigi, which highly weakened their ability to jump temporarily. They first appear in World 1-2. When the Micro-Goombas are launched, they will slowly float down to the bottom of the screen. If they collide with Mario or Luigi, they will cling onto him, slowing him down and preventing him from jumping high. Mario or Luigi will have to turn left and right or jump repeatedly to knock the creatures off of him. They are alternatively called Mugger Micro-Goombas to differentiate from Pile Driver Micro-Goombas. 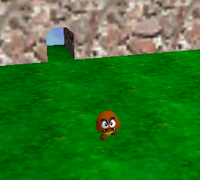 A Micro Goomba in Super Mario 64. Micro Goombas also appear in Super Mario 64 and its remake in the tiny side of Tiny-Huge Island. Micro Goombas cannot directly harm Mario, as he will only be knocked back and the Micro Goomba will be defeated upon contact. However, they are usually placed near bottomless pits or cliffs, and will often knock Mario off into these. They can easily be defeated by jumping on their heads, or by punching or kicking them, and they give off a coin when defeated, which apparently is twice as large as the Micro Goomba itself. They are slightly faster than regular Goombas and can spot Mario from very far away, unlike regular Goombas and Grand Goombas. Mini Goombas in a bonus area in New Super Mario Bros.
Mini Goombas reappear in New Super Mario Bros. When Mario is Mini Mario, he can enter miniature pipes. If he enters one, Mario may find a Star Coin. However, in some cases, Mini Goombas are in the way, and Mario has to defeat them to get to the Star Coin. In this game, Mini Goombas possess the intelligence of any other Goomba. As Mini Mario, they can be defeated by jumping on them, but by any other form of Mario, they can be defeated by simply walking into them. They are the only enemy in the game which Mini Mario does not need to Ground Pound to hurt or defeat. They only pose a threat to Mini Mario; any other form makes it impossible for the player to get hurt by these creatures. The Mini Goomba as it appears in Super Mario Galaxy. Mini Goombas are seen in Super Mario Galaxy, this time being slightly larger than previous Mini Goombas and looking more like Goombos from Super Mario Land in terms of shape. They are uncommon enemies, as they are only found in only a select number of levels. They act in a different manner than Goombas in this game, as spinning and instantly defeating them only yields a coin instead of three Star Bits. They also do not attach to the player, and more or less act like normal Goombas. They reappear in New Super Mario Bros. Wii, this time in the open world. Mostly in groups, they are not dropped by Paragoombas, but they still weigh Mario down by swarming on him. They no longer hurt Mario even if he is Mini Mario; however, the plumber can do a Spin Jump to get the pesky enemies off. After being spun once, Mini Goombas are defeated. Despite their size, Mini Goombas still let out a coin when hit by a fireball. They made appearances on World 5-4 and 7-5. Mini Goombas reappear in Super Mario Galaxy 2, looking and acting the same as Super Mario Galaxy. They are more common in this game, and they will leave a Star Bit behind when defeated with a spin, rather than a single coin as seen in Super Mario Galaxy. However, they will still leave a coin if stomped on. Magikoopas may spawn Mini Goombas. Mini Goombas reappear in New Super Mario Bros. 2. They act the same as they did in New Super Mario Bros. Wii. They can be defeated by simply jumping on their heads, like regular Goombas. If they attach themselves to the player, the player can ground pound to get rid of them, attack them as Raccoon Mario, or simply walk around for a few seconds until they go away. They are no longer dropped by Paragoombas like in Super Mario Bros. 3, and instead are seen simply walking around. They also appear in gold form in World 5-3 and World 4-1. They can only be seen in 5-3 by getting a Gold Ring, going fast to the Pipe Cannon or using the Super Leaf to fly up to the Mini Goomba's platform when Mario or Luigi get to the edge of the first cliff after getting the second one. Mini Goombas return once again in New Super Mario Bros. U acting as in the previous games. They mainly appear in the level Magma-River Cruise of Peach's Castle in large numbers. They occasionally appear in the battle with Kamek in Slide Lift Tower. Mini Goombas in Super Mario 3D World. Mini Goombas reappear in Super Mario 3D World, keeping their appearance from the New Super Mario Bros. games. They act like normal Goombas in that they chase Mario upon approaching them, though in this game they can actually hurt the player upon contact. They generally appear in groups, and sometimes hide inside crates and other breakable objects. Ground pounding near them or blowing into the microphone on the GamePad causes them to be pushed away. They can be defeated like normal Goombas, and can also be defeated by tapping them on the GamePad screen. Mini Goombas make a minor appearance in Super Mario Maker and Super Mario Maker for Nintendo 3DS. 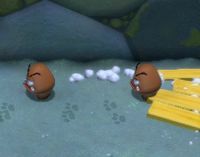 When the player shakes a Goomba while editing a level, it will split into two to five Mini Goombas, but they will fall off the screen as if the player erased the Goomba. The same thing can be done with a Galoomba. However, they cannot be used in a player's level. Mini Goombas in Super Mario Odyssey. Mini Goombas return in Super Mario Odyssey, where they act as they did in Super Mario 3D World; they appear in Bowser's Kingdom, the Cap Kingdom, the Lake Kingdom, the Metro Kingdom, the Mushroom Kingdom, the Sand Kingdom, the Seaside Kingdom, and the Wooded Kingdom. They are colored bright yellow this time, resembling their appearance in Super Mario All-Stars. They can occasionally be found by breaking crates and by Ground Pounding certain spots on the ground. Unlike regular Goombas, they cannot be captured. 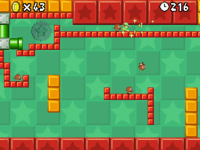 If the player steps on eight Mini Goombas in a row without touching the ground, a Heart will appear. Additionally, if he jumps on 32 Mini Goombas, a Life-Up Heart will appear. This can only be done in the zipper bonus level in the Lake Kingdom. While Mario is exploring the Mushroom Kingdom in Double Trouble, he can encounter a swarm of Para-Goombas, which begin dropping Micro-Goombas on him. If Mario decides to pick the Micro-Goombas off instead of running for cover, the tiny Goombas will knock him out with some noxious gas, though their parents will leave him alone after finding him unappetizing. If Mario makes a run for some pipes instead, he will pick the Micro-Goombas off, and be left alone when the Para-Goombas grow bored of waiting for him to come out. "My speak soft, BIG STICK!" Micro Goombas (retranslated as Goombettes) appear as a group of monsters. As enemies, they only appear in the battle with Hidon in the Sunken Ship. Despite their diminutive size, they are actually stronger than an average Goomba, but barely have any special moves except for Poison. Three of them (better known as the Triplets) also reside in Monstro Town, helping to run their mother's store. The shop sold Mushrooms that heal 30 HP, but turn the player into a mushroom, possibly referring to the Micro-Goombas' slowing-down effect in Super Mario Bros. 3. However, the party member who ate the mushroom steadily heals his HP as long as the Mushroom status remains. In Super Princess Peach, Micro Goombas appear with a role similar to that in Super Mario Bros. 3. They are dropped by Paragoombas and will limit Peach's jumping abilities if they make contact, weighing her down. To shake them off, Peach must jump a few times or use her Rage or Joy vibes. Micro Goombas in Mario & Luigi: Partners in Time. In Mario & Luigi: Partners in Time, in the Mrs. Thwomp battle, Micro Goombas make up the miniature clones. In Super Paper Mario, Micro Goombas are not seen and only mentioned. A resident in The Underwhere mentions that he died all because of a Micro Goomba and a bottomless pit. 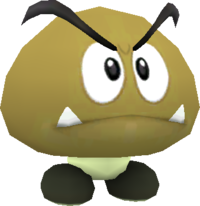 A Sammer Guy named "Micro Boomba" is a reference to this type of Goomba. Usual: "Goomba power!" ~ "Mario's huge, huh?" ~ "Hey! I'm small-boned!" ~ "It's not the size of the Goomba in the fight...."
In Paper Mario: Color Splash, Mini Goombas are referred to as Small Goombas, as they are actually regular-sized Goombas enchanted by Kamek, and appear in the Sacred Forest. A bunch of Small Goomba Gangs scatter the blue Mini Paint Star of that level into five pieces. Five Small Goombas can band up to form Small Goomba Wheels; however, Small Goomba Gangs are more dangerous and will pummel Mario down a large chunk of his health if they remain together. During battle, the Small Goomba Gangs become increasingly smaller as Mario hits and scatters them, making them far more manageable. Chibi Kuribō Bean Goomba, referring to its small size. Its Psychopath thought is a reference to the United States of America's twenty-sixth President, Theodore Roosevelt. His motto was "Speak softly and carry a big stick. You will go far." ↑ Loe, Casey. New Super Mario Bros. Player's Guide. Page 10. ↑ von Esmarch, Nick. 2012. New Super Mario Bros. 2 Prima Official Game Guide. Page 21. ↑ Stratton, Steve. New Super Mario Bros. U PRIMA Official Game Guide. Page 33. ↑ Musa, Alexander, and Geson Hatchett. Super Mario 3D World Prima Official Game Guide. Page 23. ↑ Walsh, Doug, and Joe Epstein. Super Mario Odyssey Prima Collector's Edition. Page 346. ↑ "The most miniscule meanies that you'll come across in any Super Mario adventure are Super Mario Bros. 3's Micro Goombas, Baby Bloopers and Baby Cheeps, measuring only eight pixels by eight pixels." - Mario Mania, page 156. ↑ Nintendo Power Strategy Guide for Super Mario Bros. 3, page 8. ↑ Super Mario All-Stars Limited Edition instruction booklet, page 27. ↑ Shogakukan. 2015. Super Mario Bros. Hyakka: Nintendo Kōshiki Guidebook, Super Mario 64 section, page 86. This page was last edited on April 6, 2019, at 08:58.